In a little over six months, I’ll be venturing south from my new home in the Pacific Northwest to a tiny town on the Mexican border called Campo, California. 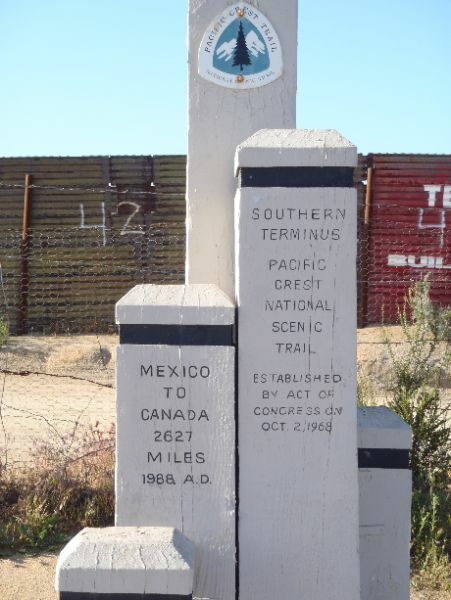 Here stands the southern terminus of one of the handful of national scenic trails in America called the Pacific Crest Trail (PCT). That’s right. Mexico (whose border is demarcated by the fence in the background) to a distant provincial park in British Columbia, Canada. 2,660 miles give or take, depending on chosen or enforced trail detours. The average hiker carves out a good four to five months to complete the journey in its entirety. If what I’ve come up with so far can be called “a plan,” it involves traversing the length of this trail beginning in April, 2015. The trail has gained popularity in the past couple years with release of Cheryl Strayed’s book Wild and the ensuing film. I haven’t read it yet–and didn’t actually know it existed until several months ago. I made the decision to attempt the hike after spending a weekend with a friend in the Bay Area in June. He made the hike in 2012 and was full of stories of fellow hikers, evening encounters with mountain lions, the ease and relief of living a life with straightforward goals and the intrigue of focusing on the more primal necessities of life. There are a handful of reasons I could cite for attempting the adventure, but the main is–why not? Reactions from friends & family were widespread. My family, eager to support any venture that involves self-inflicted suffering, was on board immediately. “You’re not going with anyone, are you?” my dad asked when I told him over the phone. “I can’t think of anyone you could stand for five months straight.” He’s got my personality pegged pretty well. I like people, don’t get me wrong. But I am fiercely independent and like to do my own thing. HYOH, as they say on the trail. Hike Your Own Hike. Go at your own pace. Eat dinner for breakfast. Carry the items you find indispensable. Wake up when you want to. Hike however many miles you want to. Then stop and sleep. Maybe it seems selfish, but I’m doing this hike for me, and I don’t want to be tied to others’ schedules. Some friends and acquaintances were less receptive to the idea, their concerns revolving primarily around personal safety. “Isn’t it dangerous to be out on your own, like, in the middle of nowhere?” the implicit follow-up being “as a woman?” Though there certainly are dangers involved, they center more around access to clean water, staying warm & dry in the elements, keeping enough food with me, and avoiding illness & injury. I am much more safe hiking alone at night in the wilderness than I am walking alone at night on the streets of Seattle. This entry was posted in Uncategorized and tagged hiker trash, pacific crest trail, pct 2015, pct 2015 blog, pct class of 2014, pct class of 2015, pct planning, solo pct, thruhiking, women of the pct by Helen Beelen. Bookmark the permalink.